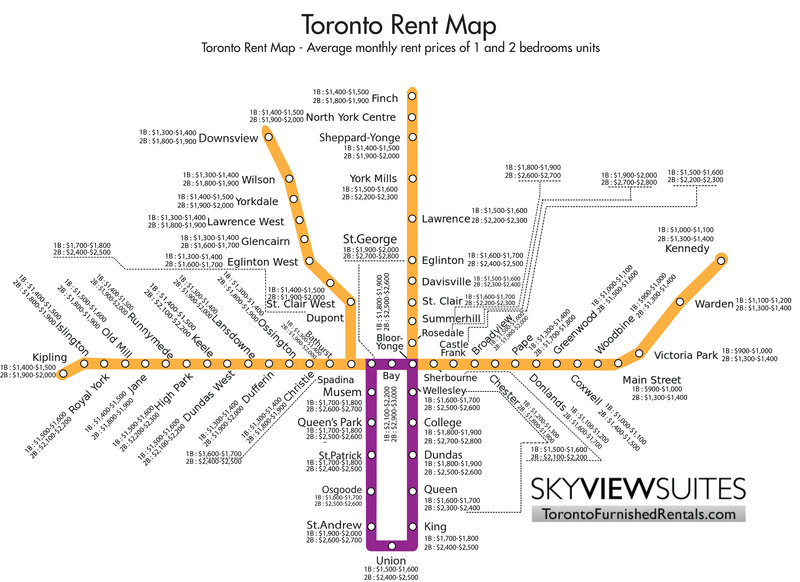 Following the popular release of Sky View Suites’ Toronto Rent Map (showing average one and two bedroom condo rents near each Toronto subway station) and the unprecedented home purchase price increases revealed in June 2016 in Toronto (up 16.4% from last June), Sky View Suites has prepared and released another infographic – the Toronto Housing Prices Subway Map in an effort to see what it costs to raise a family in a 3 bedroom+ Toronto home. 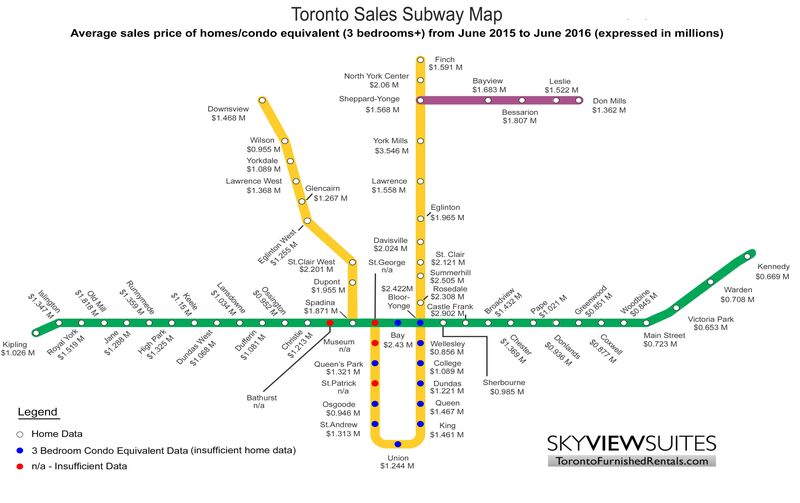 This map shows average sales prices of all home data (3 bedroom+ units) near each subway stop from Jun 2015 to June 2016. The staggering prices at certain subway stops won’t come as a surprise to some. What came as a shock to us was the York Mills subway station topping all stations at an average price of $3.5 million. For the majority of stations in the lower “U” portion of the Yonge-University line, three bedroom condo data was used due to the lack of home data available in the area (which is why the prices are lower than what one might expect for homes in that area). After analysing the data, we did some quick math to figure out the average household income required to be able to afford a modestly priced home ($1.4 million) in the city of Toronto with a 20% down payment. The first barrier is the upfront cost of $329,700 – but let’s assume this isn’t a problem for the homebuyer. As a rule of thumb, banks offer mortgages to homebuyers based on an income / house expense ratio of no more than 30%. This means that the household must have total income of at least 3.33 times the carrying costs. To put this into perspective for the average Canadian, the gross monthly salary of the total household would have to be $6,200 * 3.33 = $20,667 which works out to $250,000 per year (or roughly $125,000 per adult, if coupled). What Canadian is affording these houses? According to a study performed by Statistics Canada, only 0.3 of the population made above $250,000 in 2013. If only a small percentage of individuals living in Canada can afford these houses, where is the excess demand coming from? There is a consensus in the real estate investment community that foreign ownership is artificially bumping up home prices in the GTA. Only now is the Canadian government conducting surveys to try and understand the impact of foreign ownership in an effort to make better decisions about foreign ownership policy. It is important to note there are still plenty of areas outside of Toronto (and Vancouver) that are very much affordable for the ordinary Canadian family. However, perhaps we are entering a time where home ownership for Canadians is no longer a realistic option for most, at least in large urban cities such as Toronto and Vancouver. Historically, our current culture of home ownership has been the exception, not the rule. It’s only since the 1950s that Canadians as a society have strived for home ownership. Prior to the 1950s, home ownership was not a realistic goal for most Canadians living in urban areas. Even today, most of the rest of the world (except North America and pockets of western Europe) does not have a strong home ownership culture.